Creator Captures 2016 Belmont Stakes with Late Run by Reinier Macatangay: After finishing 13th in the Kentucky Derby (GI) five weeks ago, the gray Tapit colt Creator captured the Belmont Stakes (GI), while Preakness (GI) champion Exaggerator disappointed fans by failing to hit the board. 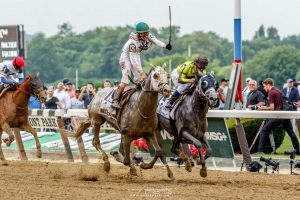 After finishing 13th in the Kentucky Derby (GI) five weeks ago, the gray Tapit colt Creator captured the Belmont Stakes (GI), while Preakness (GI) champion Exaggerator disappointed fans by failing to hit the board. 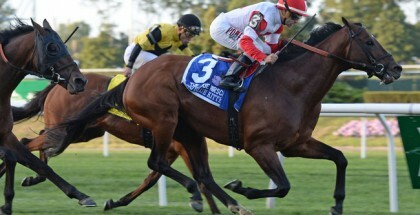 With his usual closing style, Creator won the third leg of the Triple Crown for trainer Steve Asmussen and owner WinStar Farm. He improved his record to 10-3-4-1. WinStar created a stir this week, when they announced the speedy Gettysburg transferred from the Todd Pletcher barn to Asmussen and would contest the Belmont Stakes. As expected under Paco Lopez, Gettysburg set the pace early, with Destin chasing in second and the longshot Seeking the Soul in third. Stradivari was in the mix in fourth, and they went the first quarter in 24.06 seconds. In the middle portion of the race, Exaggerator made an early outside move, and it seemed to take a toll. Gettysburg continued to lead them and Destin still chased in second as they went four furlongs in 48.48 seconds. On the far turn, and after six furlongs in 1:13.38 and a mile in 1:37.96, Gettysburg held on, but Destin began to make his move and Stradivari ranged up on the outside. Governor Malibu was on the rail looking for room. Creator was right behind the leading group and in position to strike. Turning for home, Destin took command of the lead. Creator had dead aim though, and Lani came flying on the outside as well. Destin was tired and Creator nosed him out at the wire for the win under Irad Ortiz Jr. 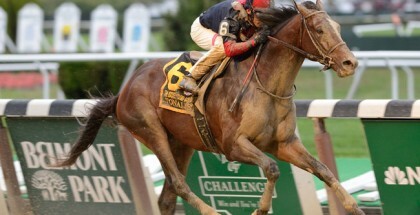 The trainer credited his young jockey, who regularly rides on the New York circuit, for the win. “I thought Irad gave him a dream trip … to have our first Belmont win, I’m just very proud of our whole team,” Asmussen said in a post-race interview. Lani finished third and Governor Malibu was fourth. Creator paid $34.80 to win, $14.60 to place and $9.40 to show. Destin paid $9.40 to place and $6.20 to show. Lani paid $6.60 to show. The Triple Crown series is over and produced three different winners! 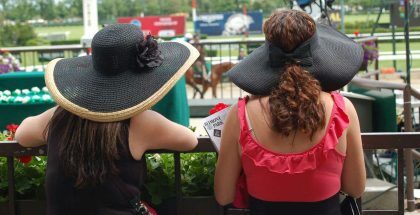 The 3-year-old horses will next be pointing towards the Haskell Stakes (GI) at Monmouth Park and the Travers (GI) at Saratoga in late-summer.